Jean Baptiste Chevrier was born in Buxeuil on June 4th, 1881 with Plancoulaine. In 1890, his parents bought a coffee house attatched to the Town hall in Descartes, that his mother kept until 1924. It is today the "Coffee Commercial". However, on January 8th, 1892, whilst merely taking a walk, the teenager is shot and wounded by a rifle and thus loses his sight. In October 1893, Jean Baptiste Chevrier entered to the Institution Nationale des Jeunes Blind to Paris (National institution of the young and blind in Paris) and obtained a title as a teacher for blind men. Graduate of literature and a first class player of the clarinet and the piano, he embraced the satyric career of a songwriter and then of a composer. He then chose the pseudonym of Rene de Buxeuil, so he could be said "to be the third Rene after Descartes and Boylesve". 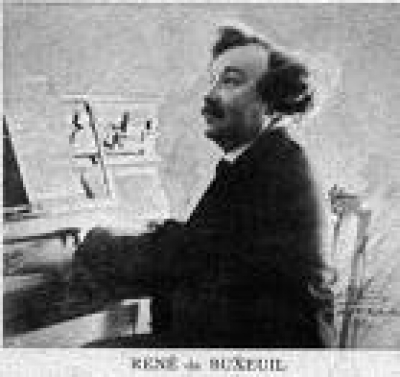 Rene de Buxeuil saw a fast rise to recognition. All contributors to his success: his infirmity, his words and his music. During the First World War, ihe organized an audience with the armies and sang on the front line and in the hospitals. He died in Paris on July 29th, 1959 at 78 years. He rests with the cemetery of the Lachaise Father in Paris vis-a-vis Colette and near to Alfred de Musset.